Canadians are among the most skilled and highly educated workers in the world. But today, the evolving nature of work means that people may change jobs many times over the course of their working lives, or may require new skills to keep their jobs in a changing economy. For working Canadians, this presents a new challenge: how to get the training they need to keep their existing jobs, or prepare for a new one. Budget 2019 introduces a new personalized, portable tool to help all Canadians get the skills they need to find and keep good jobs: the Canada Training Benefit. A new, non-taxable Canada Training Credit to help Canadians with the cost of training fees. Eligible workers between the ages of 25 and 64 would accumulate a credit balance at a rate of $250 per year, up to a lifetime limit of $5,000. The credit could be used to refund up to half the costs of taking a course or enrolling in a training program. An individual’s credit balance would be included in the information the Canada Revenue Agency sends them each year. A new Employment Insurance Training Support Benefit to provide workers with up to four weeks of income support through the Employment Insurance (EI) system. This benefit, expected to launch in late 2020, would help workers on training leave and not receiving their regular paycheque cover their living expenses, such as rent, utilities and groceries. 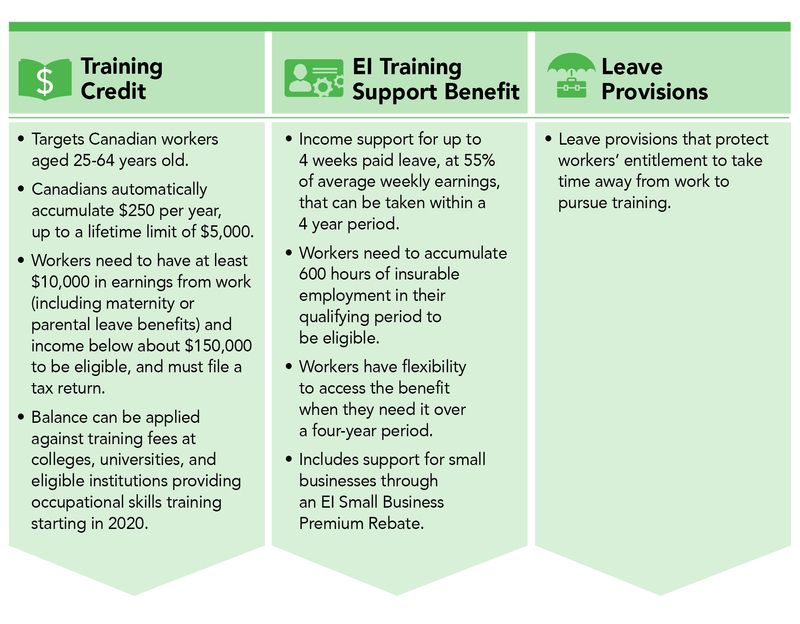 To ensure that the Training Support Benefit workers for employers as well as workers, Budget 2019 also proposes to introduce an EI Small Business Premium Rebate to offset the upward pressure on the employer premium rate for small businesses resulting from the introduction of the new EI Training Support Benefit. New leave provisions to protect workers’ ability to take time away from work to pursue training. The Government intends to consult with provinces and territories on the design of the new Canada Training Benefit, to ensure that workers can take the time they need for training, knowing that they’ll have a job to come back to when their training is done. A $1,000 Canada Training Credit balance, which can be claimed fully against training and tuition fees of $2,000 or more. Up to four weeks of income support through the EI Training Support Benefit, paid at 55 per cent of average weekly earnings. To deliver the Canada Training Benefit, Budget 2019 proposes to invest more than $1.7 billion over five years, starting in 2019–20, and $586.5 million per year ongoing. As a comprehensive collection of supports, this new program targets the most pressing barriers to ongoing learning and retraining. By cutting the direct cost of training by up to 50 per cent, workers can more easily save for—and benefit from—new training and new skills. And for employers, it means workers with continually upgraded skills will be more confident about their ability to succeed, and better able to help employers—and Canada’s economy as a whole—adapt and grow. Step 1: Workers who identify a training course would discuss their plan with their employer, letting them know they’ll need a few weeks of leave to attend the course. Step 2: Workers register for the course and provide their employer with proof of enrollment, so that the employer will know the leave is for training. Step 3: Once on leave, workers would apply for the EI Training Support Benefit to take advantage of the paid training leave. Once the application is processed, they will start to receive up to 55 per cent of their average insurable weekly earnings, for up to four weeks. Step 4: After completing the course, workers would return to work. When they file their income tax return, workers can claim up to half the fees against their Canada Training Credit balance.